satire « kNOw Future Inc.
After a false alert five days ago, http://www.lucavolonte.eu, the site set up by Les Liens Invisibles :: Image-guerrilla group, has now been shut down by the Italian Postal Police. Luca Volone, let it be recalled, is the MP who demanded the police close down the Operation Pedopriest game created by molleindustria. As of this morning noblogs is back online. After communications from Italian officials the US service provider housing the blog platform had blocked access to the site. Following consultation with their legal advisers they came to the conclusion that the content was legal and normal service resumed. Today also saw the launch of a new website, http://www.lucavolonte.eu, named in homage to the Christain Democrat MP who initiated all of this nonsense on June 26th, for more details see the entry below. The new site bears a striking resemblance to Volonte’s own web page but also contains the Operation Pedopriest game that he tried so hard to suppress. Play it online here. Update: http://www.lucavolonte.eu is back online after having been down in recent hours. Many close friends of mine in Italy take part in a collective technology project called autistici.org. Late last year they unveiled a new service to their users, a blogging platform called noblogs.org, which currently hosts several hundred users and is rapidly innovating. In recent days the site has been shut down in an attempt to suppress a computer game written in flash named Pretofilia, an anti-clerical piece of agit-prop focussed on the abuse of children by members of the clergy. Ironically, I last met with members of autistici just a few weeks ago as they continued to establish servers housed in other jurisdictions, a precaution now demonstrated to be very, very well-founded. The author of the game, molleindustria, has written many other political games, many of them focussed on labour casualization. The government took the bait and the security services were wheeled into action. Right, so no concern as to the ‘abominable facts’ that the game in fact highlights or for the victims of institutionalised sexual abuse? Glad to see that’s sorted out then. Given the removal of the veil of secrecy over clerical abuses in Ireland and the US over the last fifteen years, and the complicity of the hierarchy in protecting the perpetrators, a lot of clicks will be arriving from those IP ranges. Crimen Sollicitationis anyone? The game is already available from numerous mirror sites but also on rapidshare. A review of the game is available here. Molleindustria.it is a site publishing satirical flash games with provocative political content. Its last game, called “Pretofilia” (i.e. Priestophilia), is a denunciation of the widespread use of pedophilia as an excuse for censorship, and of the widespread abuse on children in the catholic church. 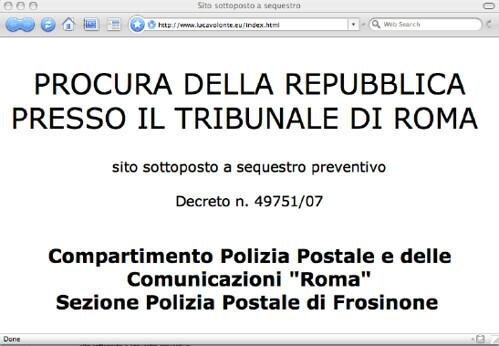 After its publishing, the site has been immediately subjected to the attention of the Italian Parliament and the Interior Ministry answered prompting the police to act against the site. Molleindustria decided then to remove the game, but the file had already been spread far and wide on the Internet. Soon after the news of the censorship threat was made known on the website, the game was mirrored even more, eventually also on some blogs on our noblogs.org platform. After all that had been said and done on this harmless satire, we would not dare to say we did not expect some threats to our servers, but we would not have imagined that a small swf file could wake up someone so up above us to block all of noblogs.org (including all the blogs used by hundreds of people for their daily communication). And when we say so up above us, we mean it! Last night God itself called the provider hosting noblogs.org and demanded the whole server to be shut down. In the heavens above there are no fax machines, so the Almighty has deemed its voice by phone to be authoritative enough. Unfortunately God never minds the Unbelievers. Apart from being nerds, we are also strongly skeptical by default and we tend not to believe what anyone tells us unless we can touch it and feel it with our own hands. So we do not trust God’s voice by phone to be authoritative enough and are asking for a concrete and official injunction to shut down the site. While we wait for the Almighty to have some of its representatives on Earth send a very material letter or order, we mean to reopen noblogs.org as soon as possible with all its content (and nothing less). In the meantime, we would like to stress that in our opinion Pretofilia has nothing to do with pedopornography and that we deem it a very good satire against children abuses. It could at worst wake up some criticism on how much priest’s abuses are hidden and silenced, but lately satire on the matter has been far from random. That is why we ask anyone caring for the freedom of speech and satire to mirror the game, knowing that it could imply a fair degree of legal issues and attacks by the Italian government, the Vatican, and their lot. We ask anyone to publish a link to these mirrors in the comments to our blog. If the wrath of God Almighty comes down on us, do not fear: file will prevail on p2p networks!